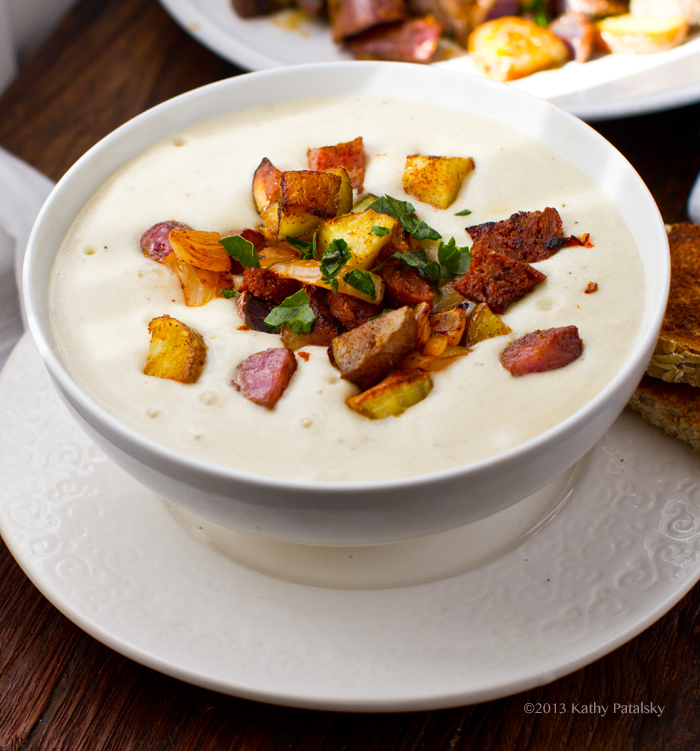 Creamy Baked Potato Soup. Vegan. Secret Ingredient Recipe. 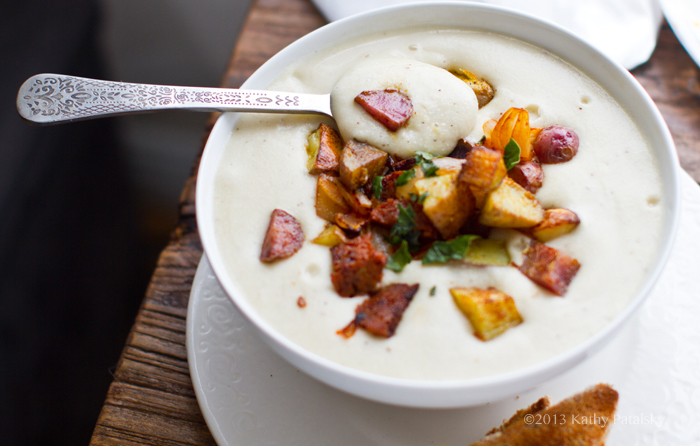 This vegan Creamy Baked Potato Soup is velvet-y and soothing, winter white in color. This simple ingredient blend with a slightly peppery, mild cheezy flavor is topped with crispy bits of roasted potato, caramelized onions and smoky tempeh bacon bits or some spicy chopped vegan seitan. Freshly chopped chives or parsley on top. Some tomatoes, vegan sour cream or even a sprinkling of plant-based 'cheddar' shreds would also be nice. Free. 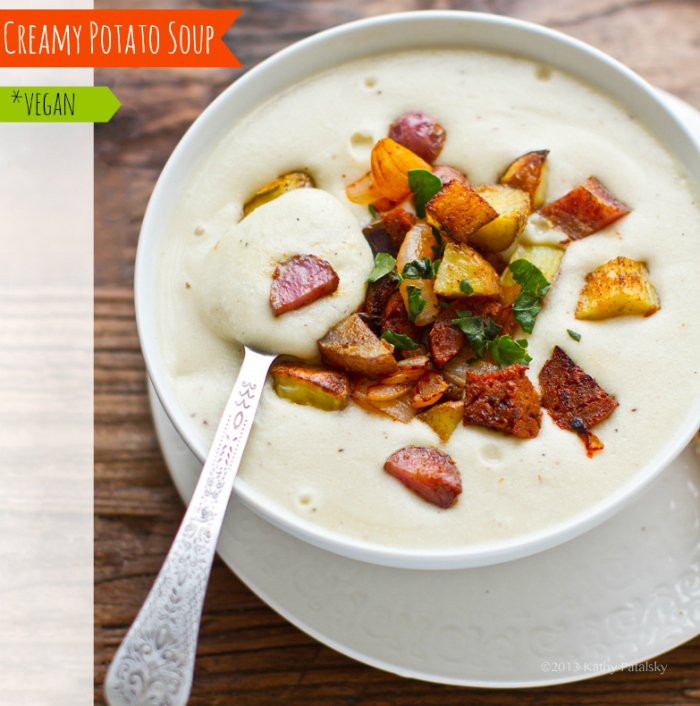 The base soup recipe is soy free, dairy free, gluten free, 'plant milk' free and cream free. Simple whole food ingredients. Yet it blends up ultra creamy with the help of a secret ingredient! 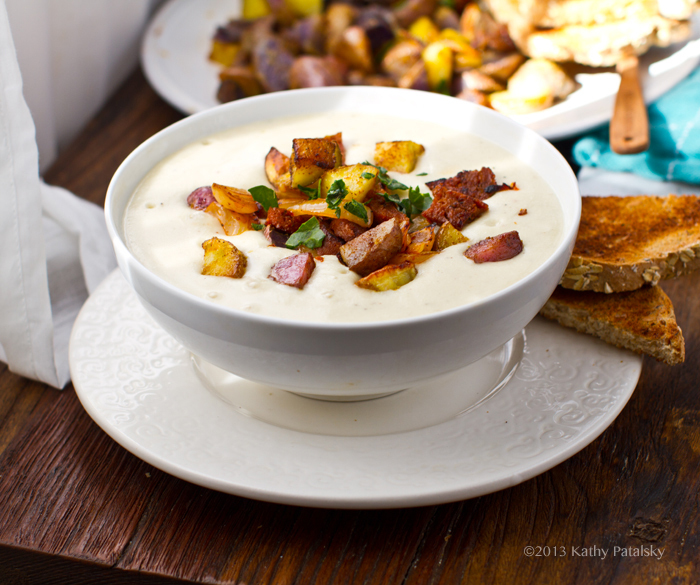 This Loaded Potato Soup was a successful special request recipe I hope you love!.. And I love veganizing cravings so I always have his soup in the back of my head. 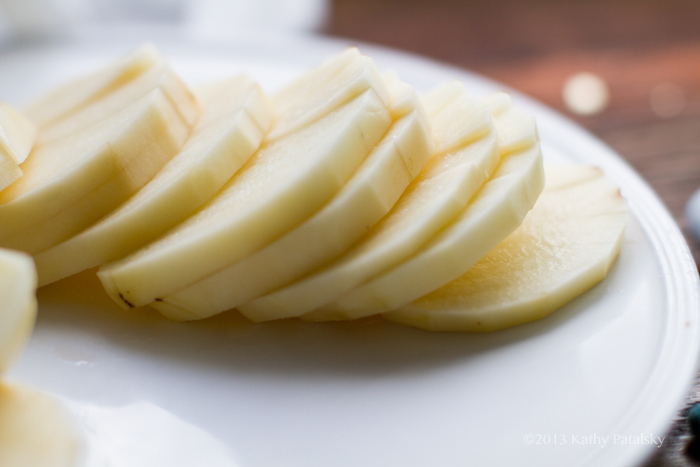 But last time I started to make it I went all healthy on him and added some green ingredients that kinda killed his "creamy white potato bliss" craving. 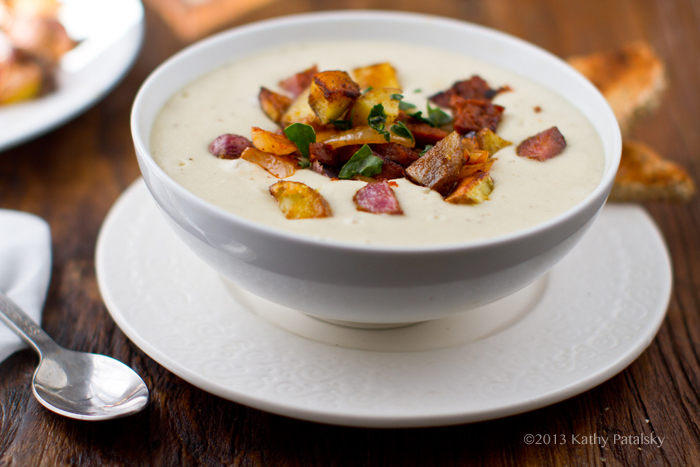 So this time I stuck to my plan and created a warm and ultra-creamy, velvet-y soup that is pure white in color. 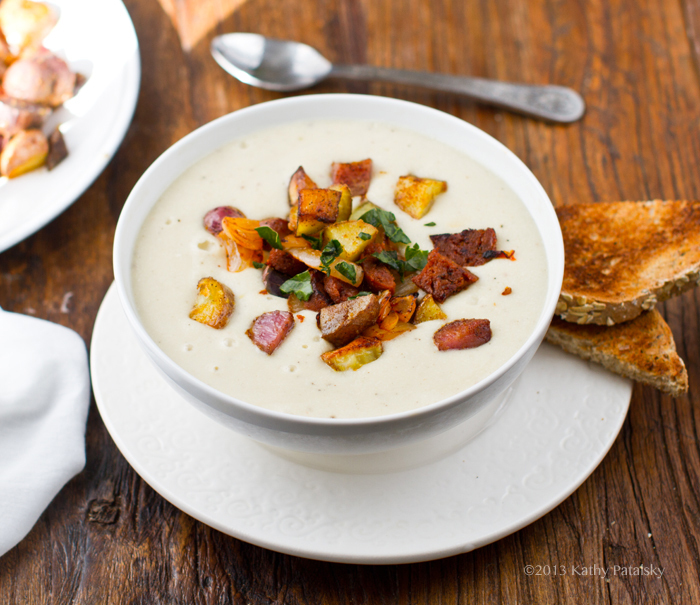 This soup is rich and indulgent .. yet quite sin-free. It contains no added oil, cream, soy or fat. Just the natural goodness and flavor from the minimalist ingredients. Secret Ingredient: Almonds! 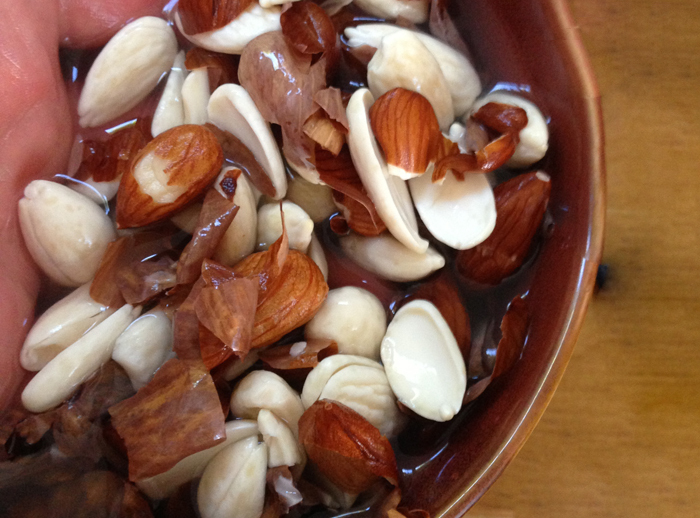 I used raw soaked and peeled almonds as my secret ingredient thickener. 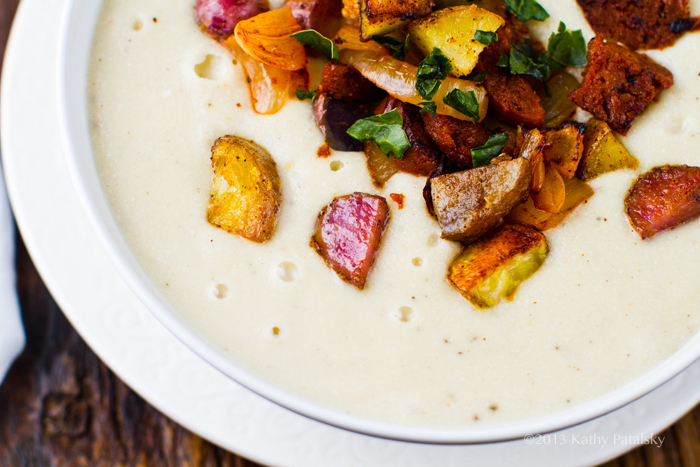 The soup has a mild undertone of almond, but it is really quite lovely and elegant paired with the rustic russett potato. note. if for some reason you cannot add almonds, try cauliflower as another cream-free secret ingredient. I used in my No-Cream of Mushroom Soup. Technique: To "peel" the almonds I did this trick. I soaked in water and a pinch of salt overnight. Then I rinsed the almonds in VERY hot water. The hottest setting on my tap or you might need boiling if hot tap water doesn't work. In a few minutes of letting them soak in that hot water the skins of the almonds easily peel off. You do have to pinch each almond individually, popping off the skin, then strain away all the peels, but the process is a nice sort of meditation. Soothing in a way. Like pitting a huge bowl of cherries, it takes time, but then that makes the soup taste that much BETTER. Once you discard all the almond skins you are left with winter white almonds. 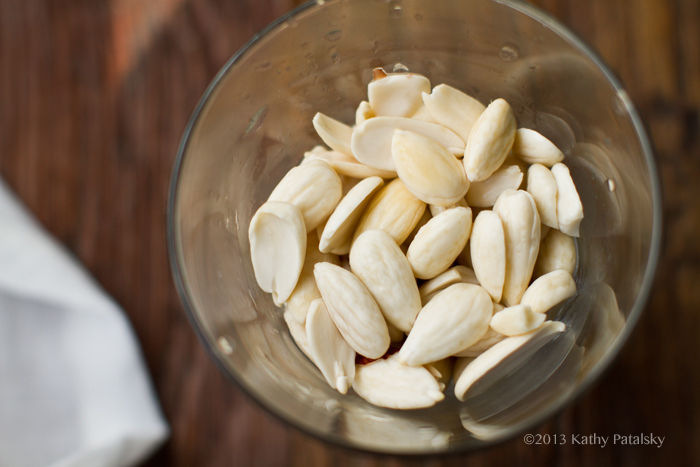 You can toss the almond skins OR use them as a fiber thickener in muffins or cookies! Or try this: toss the skins in a spoonful of nutritional yeast + pinch of salt and bake until crispy in the oven for mini almond skin chips! You could even top your soup with those chips, or a great salad topper. The remaining process is pretty easy. Just prep the garnish, blend your soup and done. (You will need either a high speed blender (Vitamix!) or a food processor to smooth out all those almonds. For the topping, you can use either smoky tempeh bacon bits or chopped spicy vegan sausages. Or maybe some vegan cheddar shreds. Or chopped onions, or diced tomatoes. Or chives. Or vegan sour cream. Or maybe even some roasted broccoli with melty vegan cheese on top. 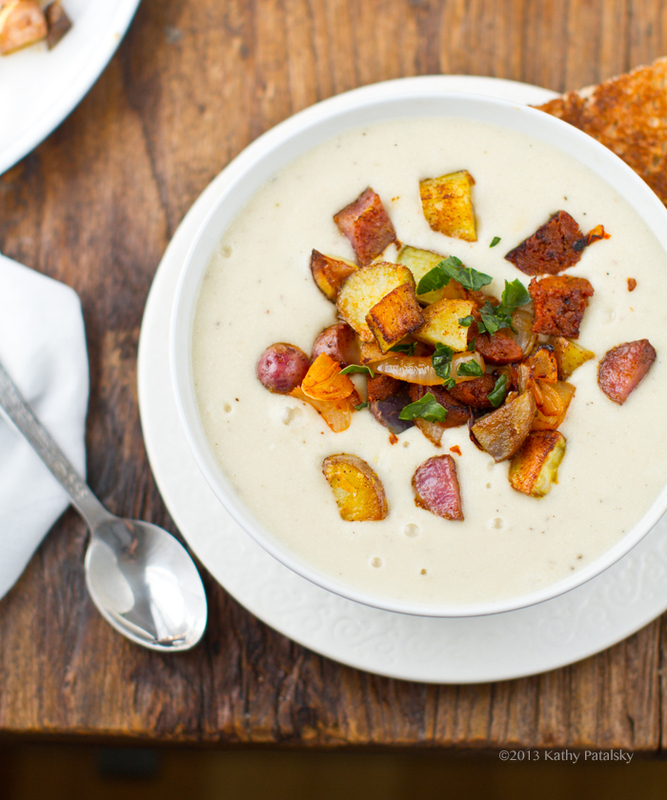 Any way you like to load a potato, load this soup! 1. Soak your raw almonds in hot salted water. You can actually do this in an hour, but your almonds will blend a bit creamier if you soak overnight. 2. 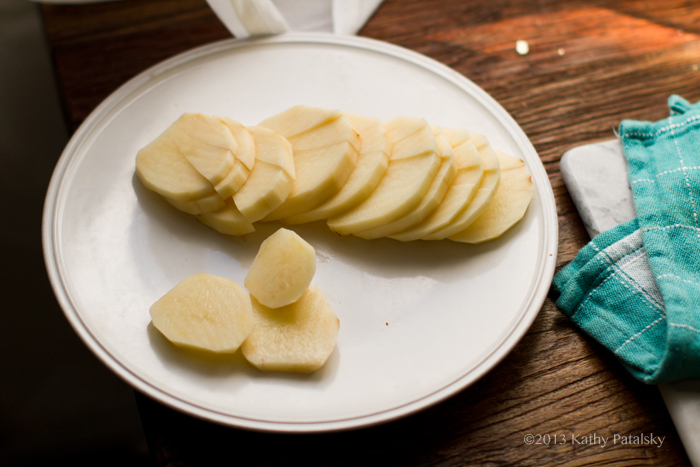 For your roasted potato garnish, heat oven to 400 degrees and dice your mini potatoes. Toss in oil, salt and nutritional yeast. Place on a greased baking sheet and roast for 20 minutes or until tender and crispy. (Remove from oven and set aside. 3. Peel your potato. Boil in how water on your stovetop until tender. Drain away water. 4. The rest is easy! 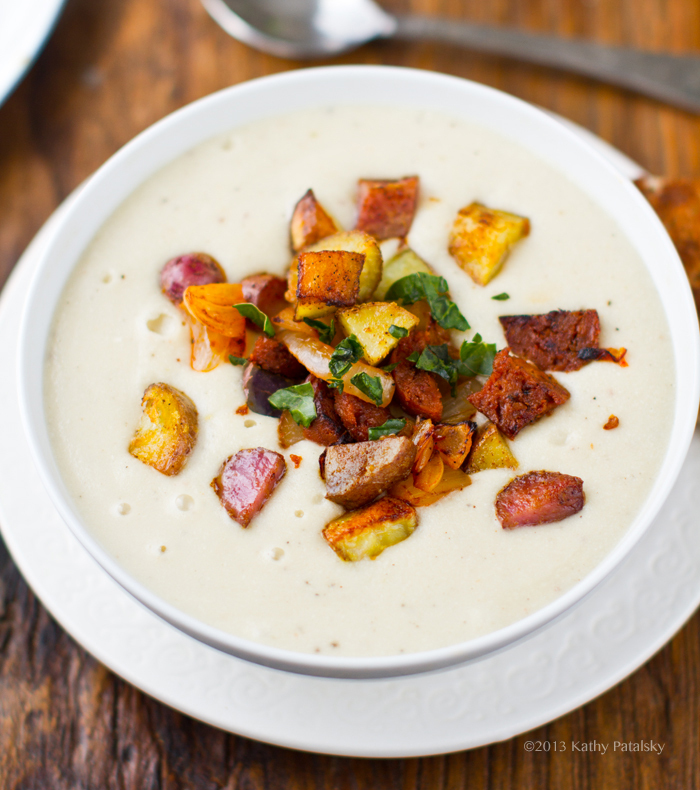 Add the boiled potato, almonds, liquid and spices to a Vitamix or large food processor. Blend until smooth and creamy. Add more liquid if a thinner soup is desired. Season to taste. Salting is very important for this soup since the base ingredients are so minimal. (More nutritional yeast is nice too, but will yellow the color a bit. 5. Quickly saute your onion and savory bits (tempeh bacon - you can also buy pre-seasoned tempeh bacon or use seasoned vegan sausages - or sub with chopped mushrooms or just use the onions) on the stove, set aside for garnish. 6. Pour soup as is or allow to simmer on the stove before serving. This soup can also easily be reheated in the microwave. 7. Garnish: crispy potatoes, savory bits with onion and something green. Try chives or chopped parsley. An accent of pepper is also nice. Serve warm.